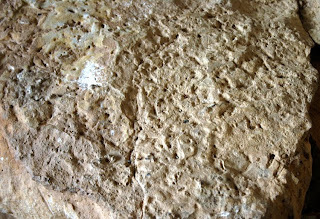 Continuing with revelations uncovered during my visit to Mesa Verde, let’s reflect upon the relationship between fossils and architecture. At Dinosaur National Monument architecture has been placed in the service of fossils. The 1957 QVC was designed to enclose and protect the great wall of fossils of the Carnegie Quarry. Extensive walls of glass took advantage of ambient light to illuminate the bones. The V-shaped roof was intended to reflect the topography of hills and gullies in the area and at the quarry site specifically. Architecture in the service of fossils. The natural order of things it seems to me. However, there are notable exceptions to this world view. 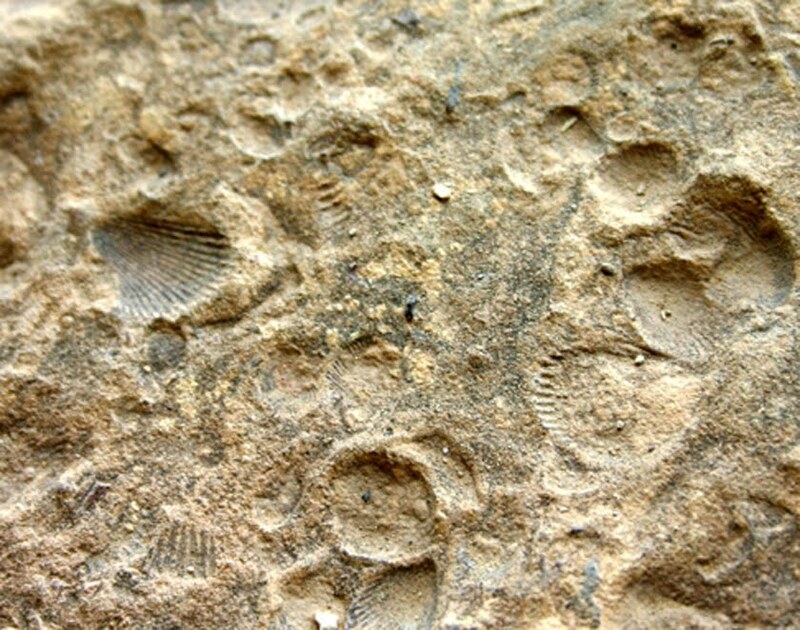 In some areas of France farmers have long built walls using fossils of the giant rudist clams, one of the major reef building marine organisms from the time of the dinosaurs. Johnson (2002 fig. 2; http://www2.fiu.edu/~goldberg/coralreefs/Rudist%20Reefs.pdf ) contains a very nice photo of one of these amazing walls of fossils. The Brazilian towns of Sao Carlos and Araraquara are extensively constructed of stone from quarries in the Lower Cretaceous Botucatu Formation. 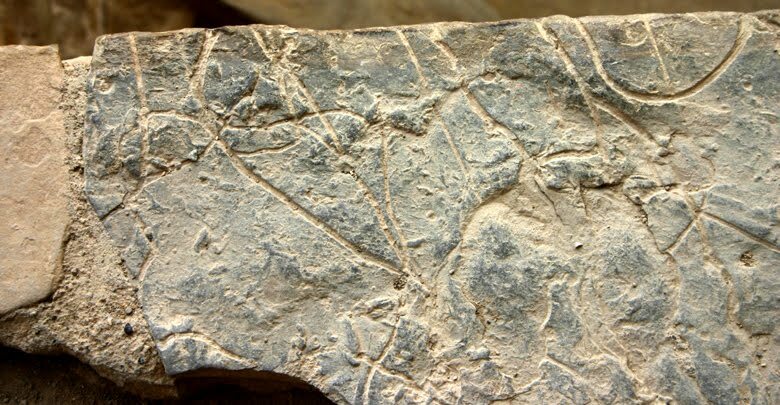 Literally thousands of fossil vertebrate footprints can be seen in the flagstone sidewalks, as well as walls of buildings, throughout these cities. As recounted by Leonardi et al. 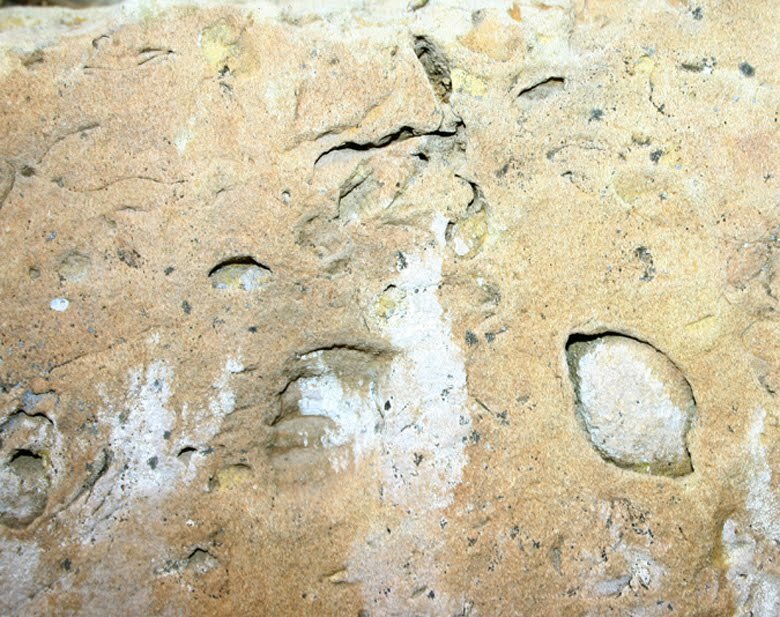 (1986), paleontologists have surveyed more than 200 miles of flagstone sidewalks in these towns and collected over 200 slabs of important fossil footprints from them. Mesa Verde is another place where we can see expressed this most peculiar philosophy of fossils pressed into the service of architecture. There are some 6000 cultural sites in Mesa Verde, although only about 10% of them are cliff dwellings. Here we’ll concentrate on the cliff dwellings, where I spent most of my time. Sandstone blocks were gathered by the Ancestral Pueblo peoples, shaped, and then usually mortared together to form a sturdy structure. Many of the complexes have long retaining walls along part or all of their front edges. On the top stones of these walls can be seen a pleasing diversity of paleontological curiosities, mostly in the form of invertebrate trace fossils. Here are a few examples. Nicely preserved section of an Ophiomorpha burrow. 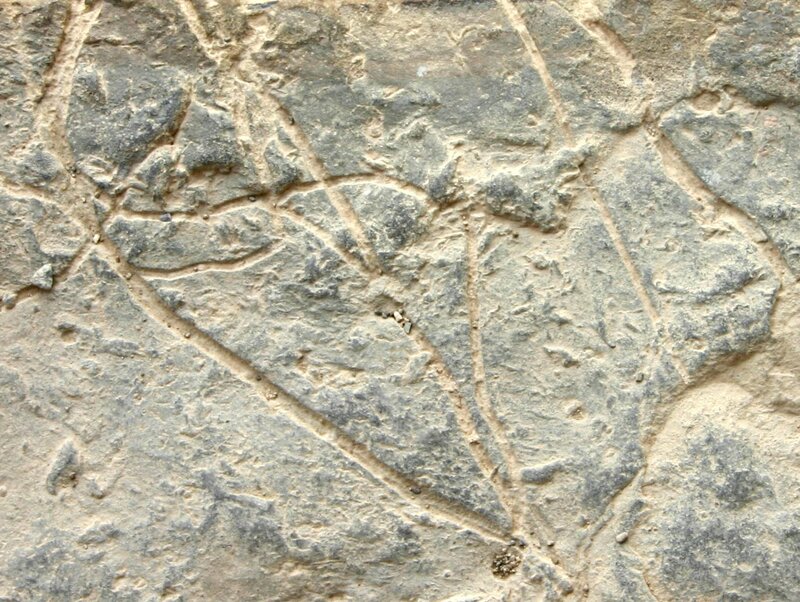 These tubular, pitted burrows were probably made by crustaceans. 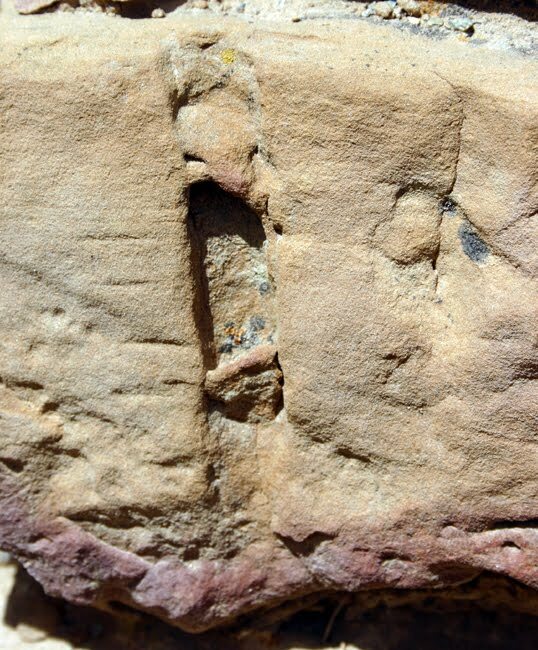 We will revisit a truly exceptional Mesa Verde Orphiomorpha deposit in a future post. 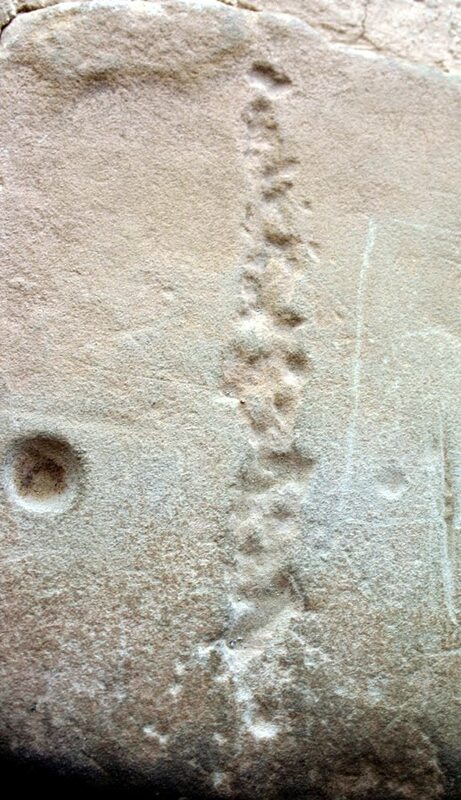 Also from Balcony House, a slab with abundant impressions of clam shells with ribbed ornamentation. Narrow, curved, non-filled burrows in hypo-relief, crossing one another on bedding plane surfaces. 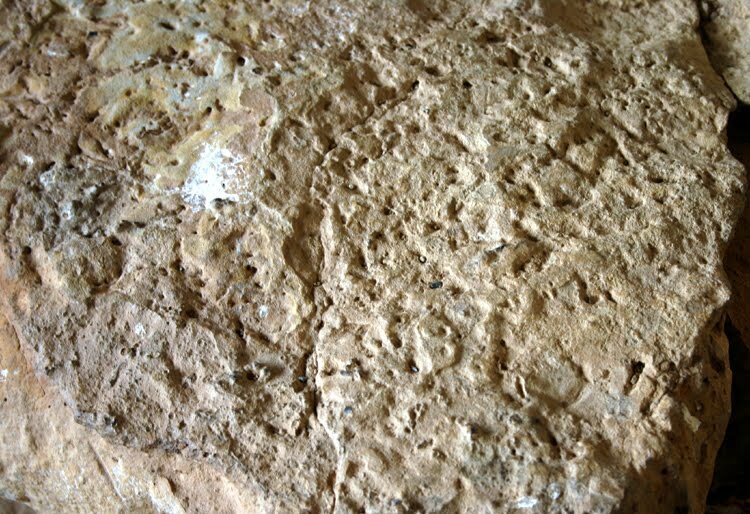 Part of the rippled sandstone floor surface riddled with vertical burrows and with short segments of burrows running along bedding surfaces. 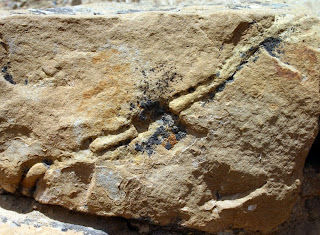 This site is a veritable wonderland of Mesozoic marine trace fossils. Here is an Ophiomorpha burrow, about a meter in length, branching and cutting across bedding. 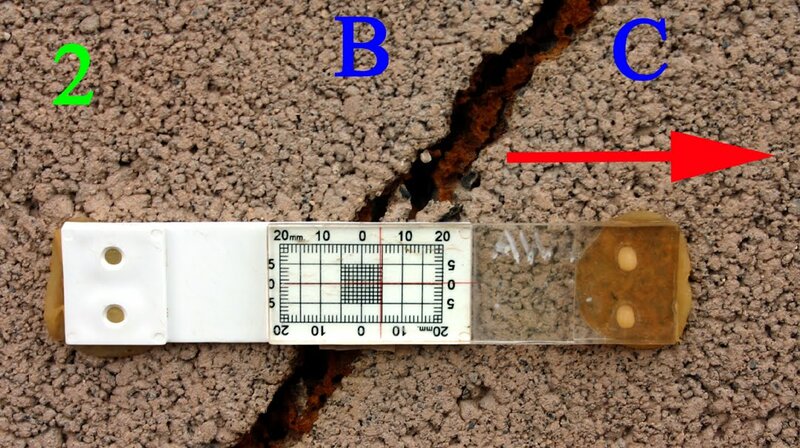 Two burrows in retaining wall. One is vertical, in hyporelief, about one-half inch in diameter. The other is an infilled non-meniscate burrow running diagnonally across bedding. This is a very peculiar trace, or possibly multiple traces. 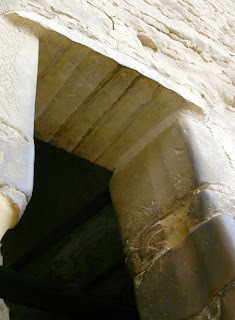 In the center is a sinuous infilled burrow exposed in hyper-relief. 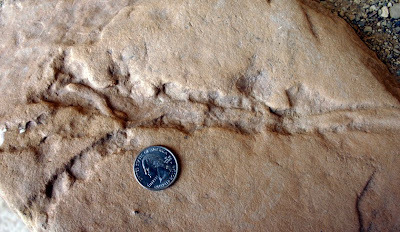 This sinuous trace appears to be within a larger elongate burrow that may branch or be crossed by similar burrows. Maybe this is an oddly preserved Ophiomorpha. A sandstone block showing cross sections and natural external molds and infillings of various marine molluscs, mostly bivalves. The block is part of a retaining wall along the trail up from Spruce Tree House, near the bottom of the trail. Long, straight and gently curved, in-filled non-meniscate invertebrate burrows running along bedding planes. 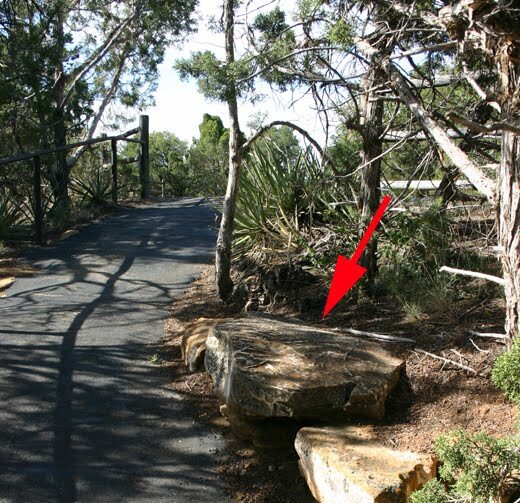 The burrows are exposed in hyper-relief on a sandstone block (red arrow) along the paved path leading to the viewpoint. In addition to fossils, sedimentary structures have also been pressed into service. 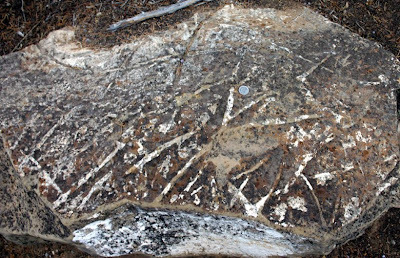 Most notable of these are ripple marks that formed on the shallow Cretaceous ocean floors. Here is a rippled slab used as the lentel of a doorway in a three story structure in Cliff Palace. It is situated such that the ripples are facing down in towards the doorway and facing whomever passes beneath it. 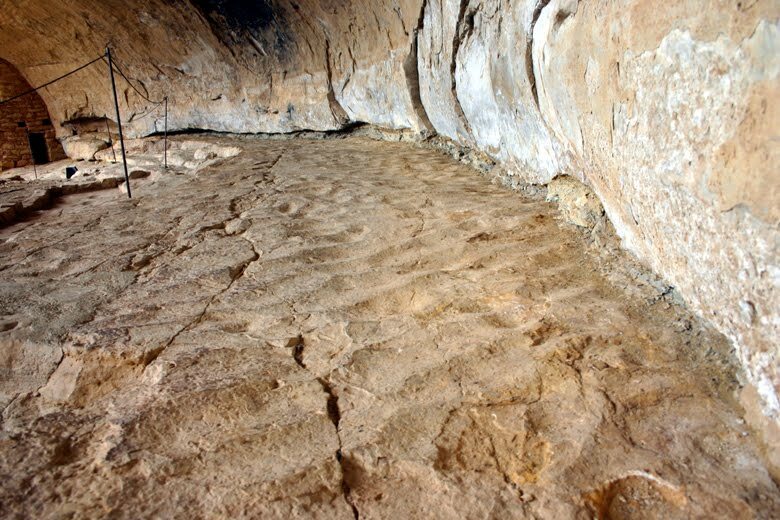 Sometimes these ancient rippled sea beds form large parts of the living floors and plazas of the dwellings. Here we can see ripples on the floor of the communal area of Long House. 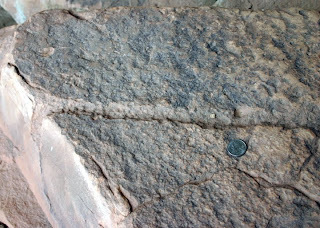 Similar extensive rippled surfaces can be seen on the floor of the southern part of Balcony House. Leonardi, G. and Sarjeant, W.A.S. 1986. 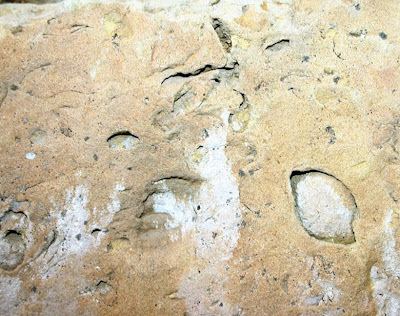 Footprints representing a new Mesozoic vertebrate fauna from Brazil. Modern Geology 10: 73-84. AM I INFECTED WITH AN ARCHITECTURAL BRAIN PARASITE? 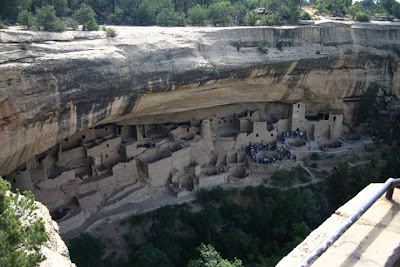 I've just returned from a short trip to the spectacular cliff dwelling ruins in Mesa Verde National Park. If you’ve never been you should. No perfectly composed, high-gloss, professionally done, light-and-color-captured-just-right photo in National Geographic can capture the splendor and magnificence of those archeological wonders. You need to physically be there, standing amongst the buildings to truly experience their grandeur. They are unforgettable. Just like that amazing wall of dinosaur bones at Dinosaur National Monument. 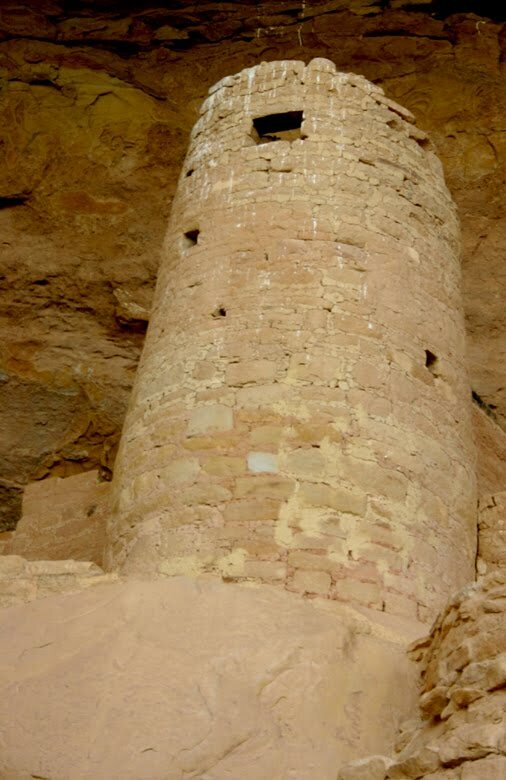 Of course, what is the first NPS structure I see the first morning as I drive out into Mesa Verde? 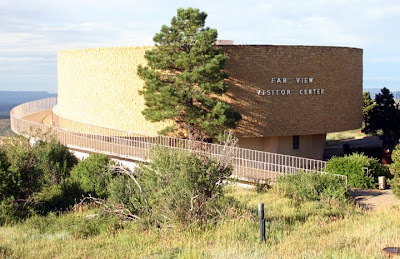 None other than the Far View Visitor Center. 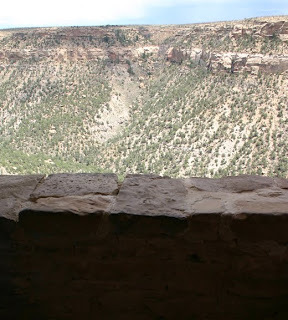 This is the place to go to purchase tickets for the several ranger led walks to the big cliff dwelling sites. 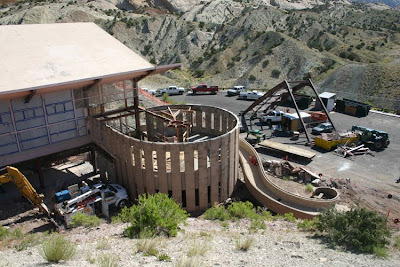 It is also very creepy because it’s a cylindrical visitor center with a winding ramp leading up to the entrance. My brain begins to ache…..where have I seen this ominous shape before? On to Cliff Palace, a quite remarkable set of structures. It is the largest cliff dwelling in the park, composed of 23 kivas and about 150 rooms. The floor plan for most of the rooms and buildings is rectangular or square. That is easily seen, even from the gathering spot for the start of the tour even 150 feet above and a half-mile away. However, nestled in between these standard buildings is the occasional oddity. A different kind of building ----yet eerily familiar. These are the cylindrical buildings. I can clearly see these towers even from the far away starting point of the tour (see red arrow). They clearly stand out to the prepared, and apparently architecturally infected, brain. I begin to wonder --- are these the ancient Quarry Visitor Center Rotunda ancestors? I am mystified that no one else in my tour group seems to notice this weird phenomenon. Why does no one else see this? Am I some kind of Ralph Roberts of towers? Here is a photo of a really fine tower in the Cliff Palace complex. It is about the same height as the QVC Rotunda. It is cylindrical like the QVC Rotunda. It is made out of rock slabs held together with mortar, similar to the cinderblock construction of the QVC Rotunda. Yet it is also fundamentally different. It does not have spiral cracks running around it. The top is not expanding outwards and overhanging the base. The second story floor is still in place and not collapsing. AND IT IS 700+ YEARS OLD!! Not a mere 50 years old like the Quarry Visitor Center at Dinosaur. How CAN this be? 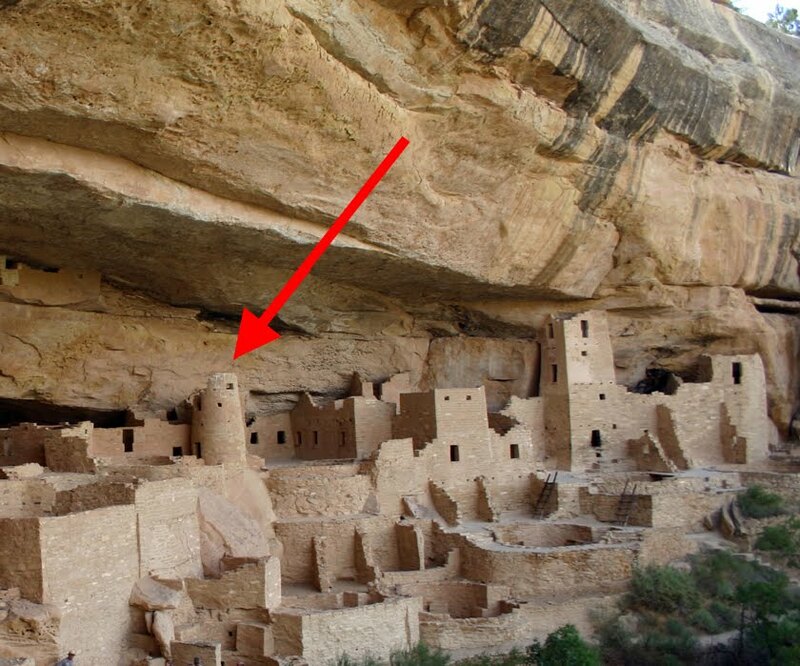 How could these ancient builders have produced a building that outlasts the QVC Rotunda by 15 times? Were they helped by ancient astronauts? Or maybe refugees from Atlantis, Lemuria, or Mu? The answer may have inadvertently come from the ranger leading our tour. She revealed that the mortar used to hold the sandstone slabs together was made by mixing together soil, ashes, water, and urine. Might that latter component be the secret of eternal life for cylindrical rock buildings? I reported this discovery to NPS engineers upon my return. I thought it may not be too late to change construction specs for the new QVC. They hung up on me. Nevertheless, I shall marshal on and maybe even begin my own strength of materials experiments back in the office. Its 5 1/2 minutes long. 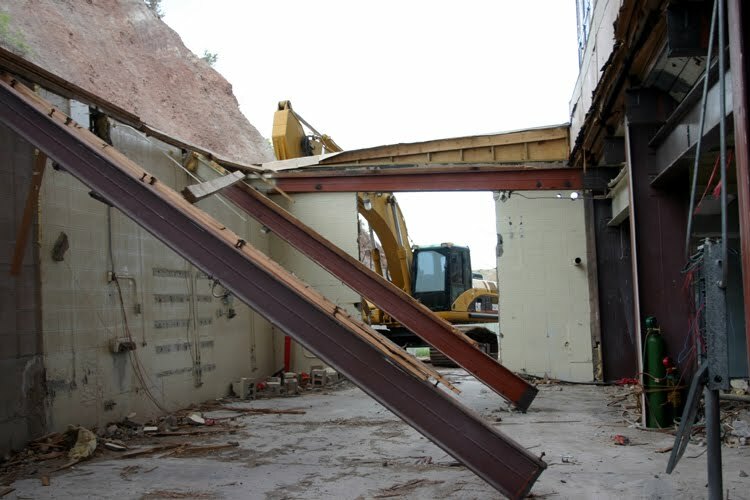 The part of the video showing the demolition of the ramp walkway into the building is sped up for the sake of time. Because of the rebar and support pillars in the walkway, it took more time to demolish than the two story cinder block part of the structure. 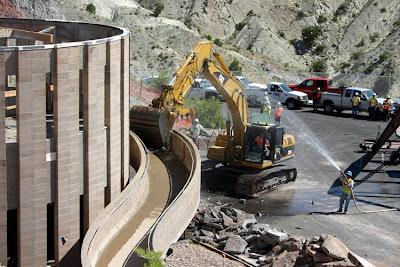 Video courtesy of Dinosaur National Monument. Video editing by GSA/NPS Geologist-in-Park Natalie DeMaioribus. 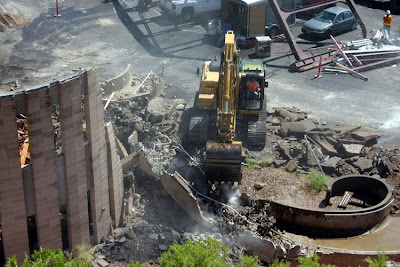 When we last left the QVC project, the demolition of the turret had just been completed. After slightly more than 30 minutes the building was little more than a nice circular pile of rubble ready to be picked up and hauled off. 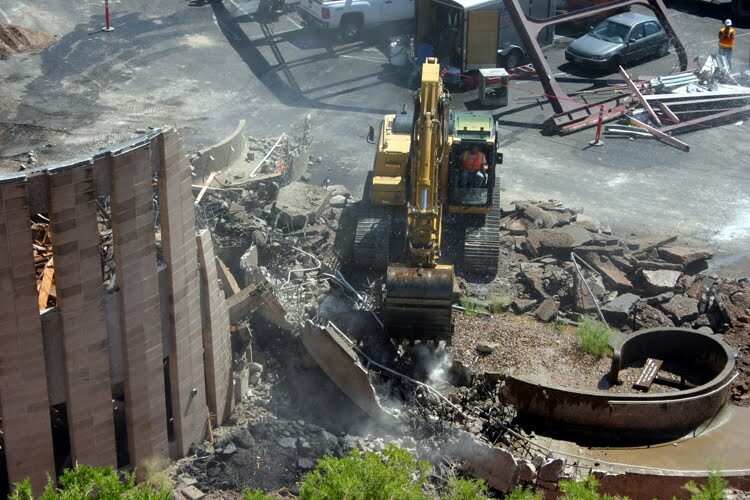 There was, of course, still the small matter of the 28,000-pound crane hauled out from inside the QVC. 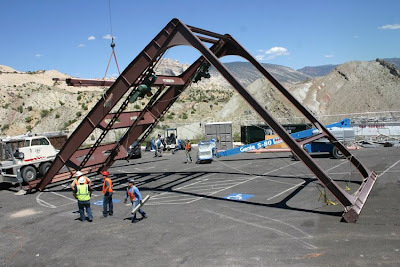 That steel superstructure was sitting in the middle of the parking lot and taking up quite a bit of space. You, constant readers, probably forgot about that and went on to spend sleepless nights worrying about whether or not LeBron James would sign with the NY Yankees. In the meantime we had our own little sporting event at Dinosaur. The crane was installed when the QVC was built in 1957/1958. Its dark chocolate brown paint was, of course, lead based. 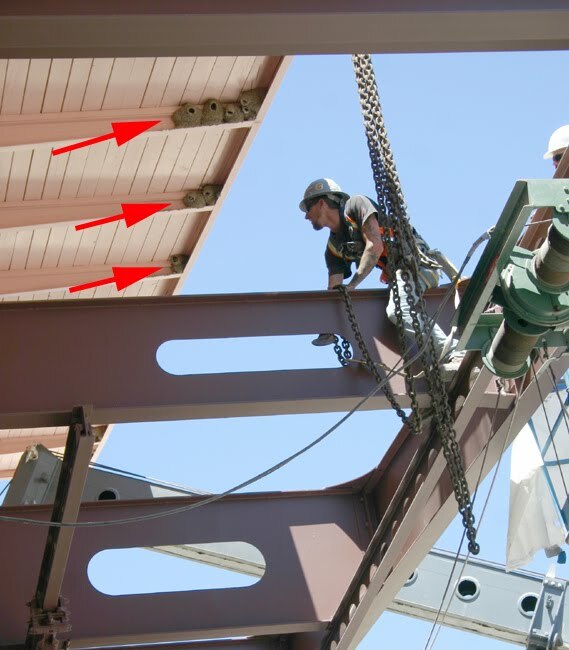 Using an acetylene torch to cut the crane up would vaporize the paint into unhealthy fumes. If it was to be cut up, then each cut would need to be identified beforehand and each area to be cut abated so that the cuts didn’t involve any paint. 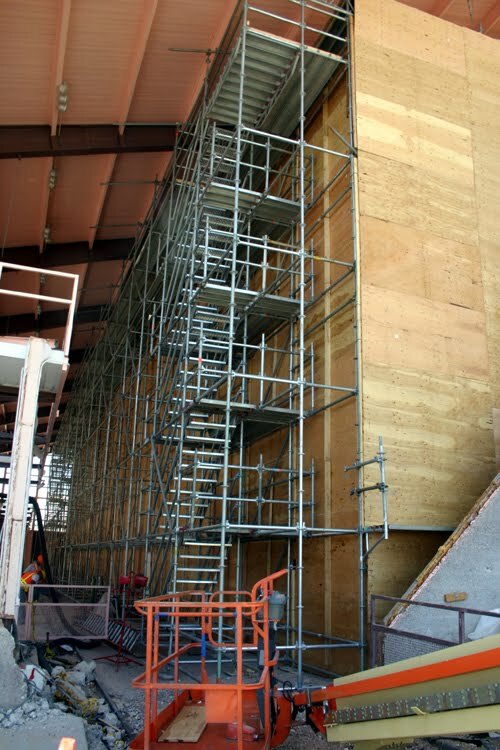 Plus a very large piece of machinery (or maybe two) would be needed to brace the frame and hold up any cut parts to stop them from falling. That was a rather cumbersome and time-consuming method. A different approach was to unbolt the individual pieces, but years of paint and stress had made it impossible to loosen the large nuts from the bolts. A more aggressive approach was needed. Into the ring steps the very same CAT that so quickly demolished the turret part of the QVC. Grabbing, twisting, and pushing broke welds and crumpled the crane. I believe the final move was described as a combination suplex/piledriver/bodyslam. 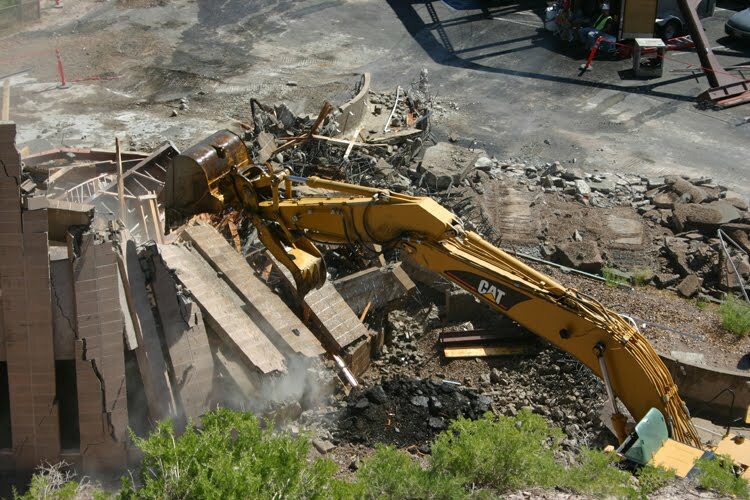 Anyway, after only 45 minutes the crane was reduced to mangled pieces of steel ready to be loaded up into dump trucks and taken away. There are unsubstantiated rumors that the SyFy Channel is interested in the rights to this great rumble in the QVC parking lot. Seem silly? Or improbable? 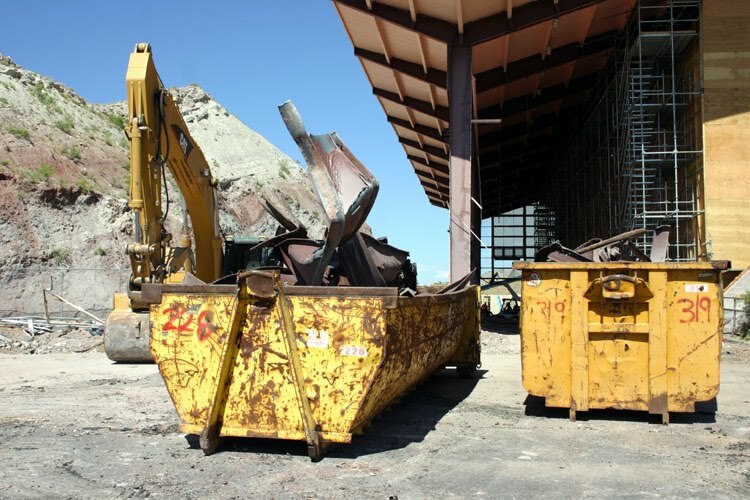 Did you ever see the 1974 TV movie Killdozer, about a murderous alien controlled bulldozer at a construction site? Or the more recent SyFy original “film” Megashark Vs Giant Ocotpus? Enough said. Photos courtesy of Dinosaur National Monument and Justin Jones NPS. 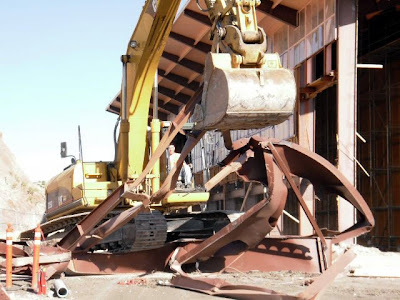 Although the extraction of the huge gantry crane out through the east wall of the QVC building was by far and away the action with the greatest threat to the fossil resources, the demolition of the rotunda remained a real concern. This two-story cinder block structure housed the bookstore, some offices, the all important visitor bathrooms, and contained the entrance and exit for the visiting public. Its instability was a major threat to visitors in the QVC and there were lingering concerns about its stability well after the building was evacuated (see more on this in my July 5 post By The Way, Did I Happen To Mention How I Feel About Accordion Music? 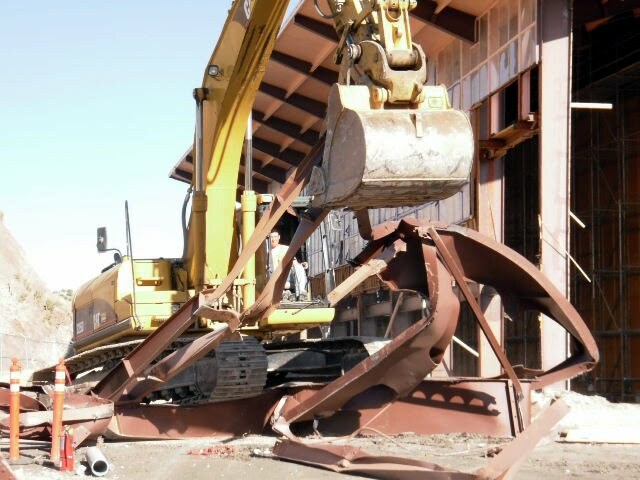 Although a few more beams and some concrete flooring are still to be removed elsewhere in the building, the demolition of the rotunda was the last major planned bit of destruction. I’m happy to say that it went smoothly. Rather than pull it down, it was pushed inwards from all sides so that at the end there was a neat pile rather than concrete and cinderblock chunks scattered around the parking lot. Two years to design. Eighteen months to build. 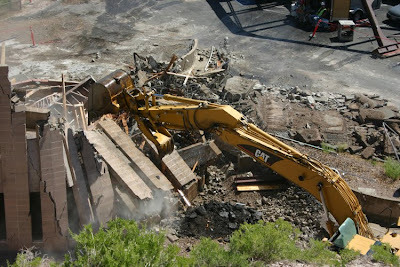 Yet it only took a skilled CAT operator 31 minutes and 5 seconds to bring it down. Really the pictures are a better testament than anything I can write, so I’ll just let the photos do the talking. We are working on an edited video of this part of the project and I’ll alert readers when it is available. 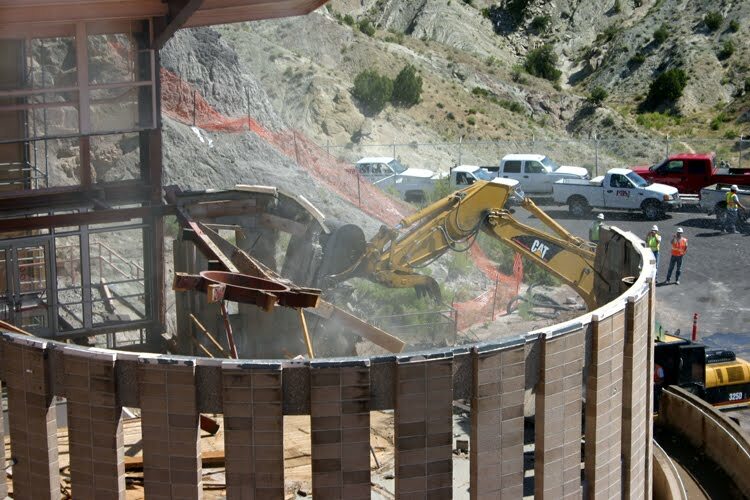 Photos courtesy of Dinosaur National Monument. So readeth the curse found inscribed in the tomb of Tutankhamun, the New Kingdom pharaoh of the 18th dynasty, who ruled Egypt between 1333 BC and 1323 BC. This curse resulted in the death of quite a number of the individuals who discovered and entered Tut’s tomb in the early 1920s. 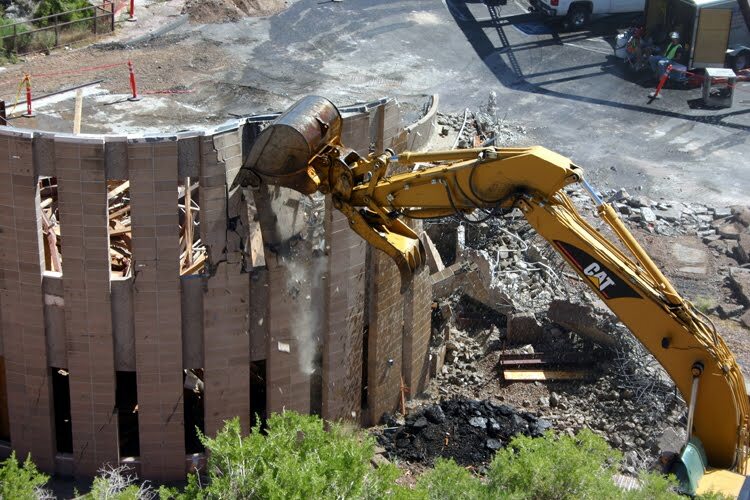 I am reminded of this bit of Egyptology because with the crane out of the QVC, we were finally able to complete the plywood sarcophagus that encloses the quarry face and will protect the bones during the remaining demolition and construction. 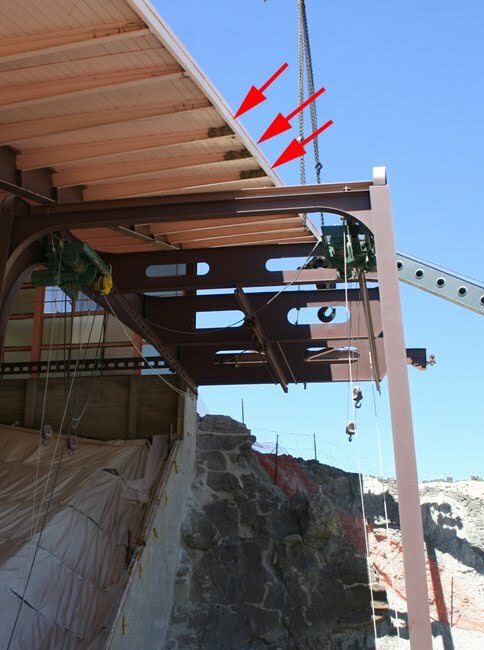 Details of the box structure have been given in an earlier post BOXING DINOSAURS (June 7, 2010) and need not be repeated here. 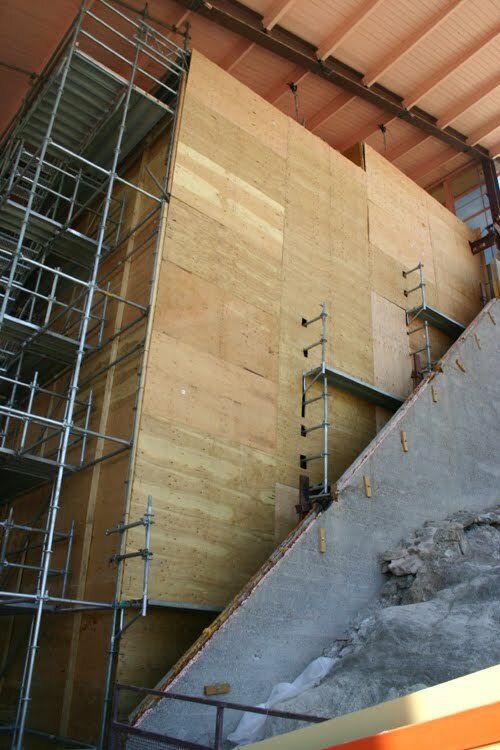 Suffice it to say that this structure, supported by a large scaffolding system, provides the best protection the quarry can have against a wide range of threats. 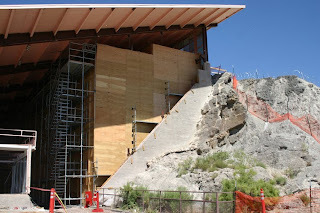 Now enclosed, the bones will remain unseen until the project is completed sometime in late summer of 2011. 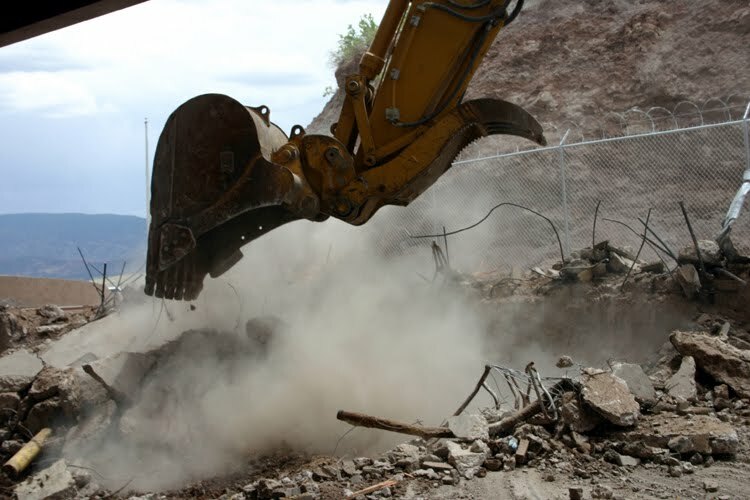 At that point the sarcophagus will be reopened, dismantled, and the quarry face will receive a thorough cleaning in preparation for its great unveiling in the new QVC. There will be no gold facemasks, ornate furniture, or elaborate jewelry on the face when it is reopened, just the tremendous and priceless display of 149,000,000 year old dinosaur bones frozen in time in the sandstone of an incredibly ancient and extinct river. However, I do suspect that more than a few amphora of wine might well be imbibed at that re-opening of the QVC. In closing, I must admit to being somewhat less than honest about the Tut curse. Recent research (1) has shown that "There was no significant association between exposure to the mummy's curse and survival and thus no evidence to support the existence of a mummy's curse." 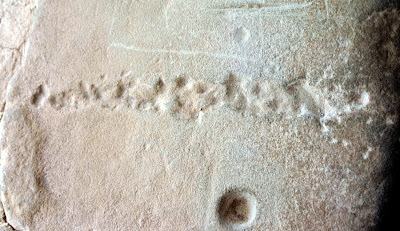 I also plead guilty to being disingenuous about the very existence of the curse inscription. The curse appears to have been created by an overzealous newspaper reporter interested in boosting sales. Nevertheless, I have it on the most impeccable of authorities that the curse is, in fact, written on the inner surface of the walls of the plywood sarcophagus at Dinosaur National Monument. It is written, of course, in English --- nowadays few of us have any familiarity with either reading or writing hieroglyphs. You remain a doubting Thomas about this? Well there are two others who have seen and read this curse on the plywood sarcophagus. And they are still alive and in good health --- for now. (1) Nelson, Mark R. "The mummy's curse: historical cohort study." British Medical Journal. 21 Dec. 2002, 325(7378): 1482-1485. Its only 3 minutes long so you'll have to wolf down your popcorn to finish before the end of the show. The clip is slightly speeded up to show all the action in a reasonable amount of time. It took slightly less than an hour to get it hooked up, pulled, and laid down in the parking lot. History is a tricky thing. Often it pops up with surprise information or facts that don’t seem to fit with our current thinking and thus forces reanalysis. Sometimes this leads to a better understanding of a problem or issue and an advancement in our knowledge. Sometimes history is just a foul tempered junkyard dog that comes out of nowhere and scares us. We just had a run in with the latter species of history. One of the interesting aspects of the historical excavations at the Carnegie Museum was the use of explosives. This was driven by the 70 degree dip of the beds. The further down dip one excavated the more overburden needed to be removed until the excavations were almost occurring in a trench. Explosives helped in loosening up the overburden. 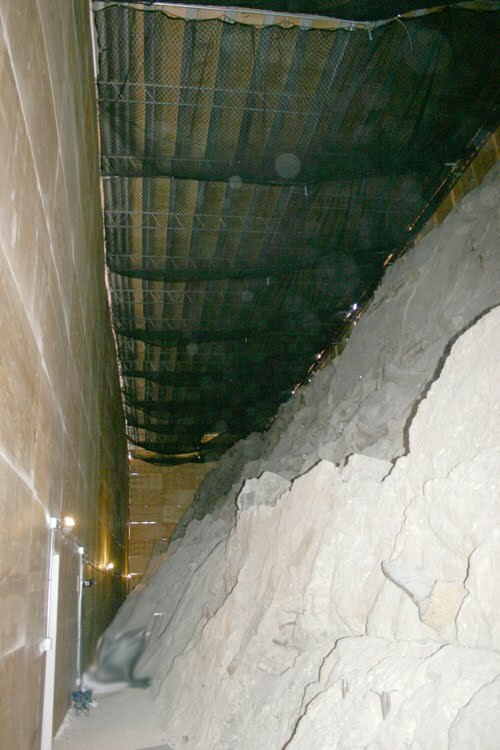 During the WPA work at Dinosaur in the 1930s, they enlarged the trench to expose a large amount of the upper surface of the quarry sandstone. Presumably they used explosives as well. We do know that east of the Carnegie Quarry there had been an explosives storage shed carved into the sandstone, although the exact location is unknown. I’ve dealt with that somewhat in my April 23, 2010 post Lions, Cows, Dinosaurs, and Dynamite. Anyway, that was ancient history. Or so we thought. 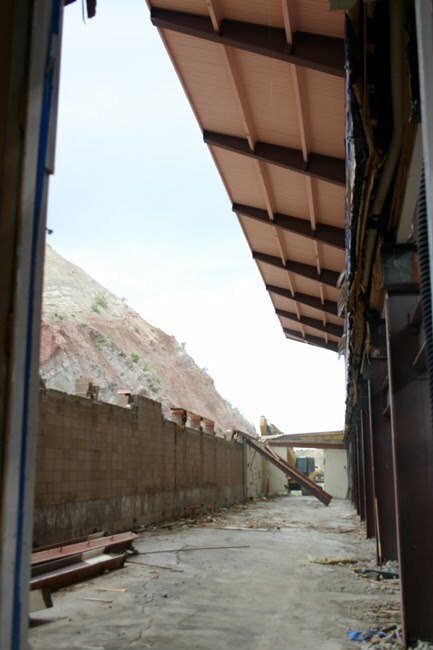 When the Quarry Visitor Center was closed in 2006 we quickly developed the Fossil Discovery Trail, which ran down the drainage immediately to the east of the closed building. One of the stops along this trail is at a continuation of the quarry sandstone inside the building. It’s a great stop, one can see lots of fossils, ranging from small freshwater clams to large dinosaur bones, all exposed by natural erosion. This became the main visitor fossil experience since the building closure and hundreds of thousands of visitors have been on the trail either on their own or as parted of a guided tour. Where it goes through the quarry sandstone is the narrowest part of the trail. Along the east side it passes within just a few feet of the sandstone. 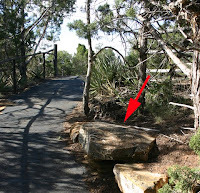 It was here, that last week, two visitors spied some peculiar cylindrical objects on the trail. 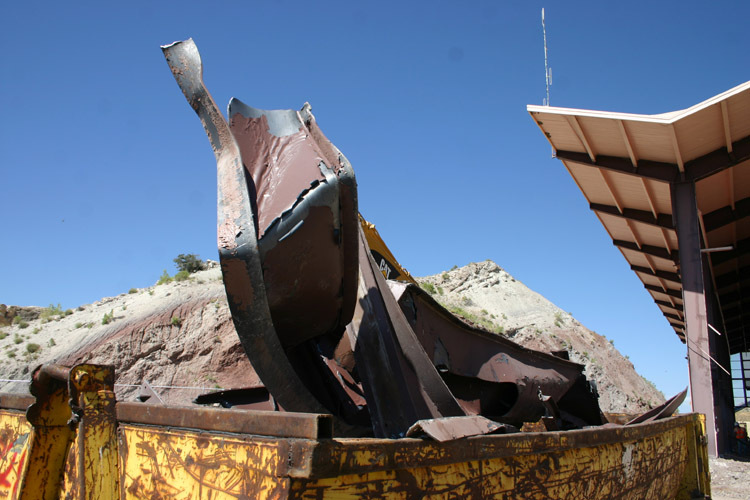 They reported it, thinking they might be trash carelessly thrown away by other hikers. However, upon closer examination they turned out to be two sticks of dynamite. Quite old. Oozing. Bulging at their ends. Unstable. This was clearly a very serious situation. 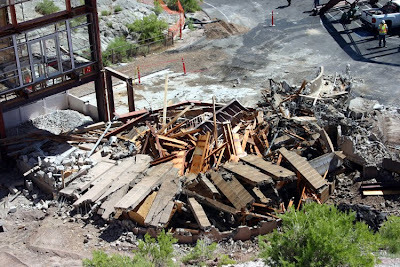 The trail was immediately closed, as were the construction activities at the nearby Quarry Visitor Center. Agents from the ATF (Alcohol, Tobacco, and Firearms) were called in. 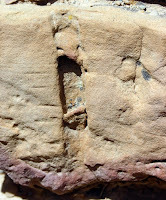 They did an area check and found two more sticks poking out of a nearby crack in a recess in the quarry sandstone. They were in similarly bad condition. All four sticks were gathered up and detonated at a safe distance. 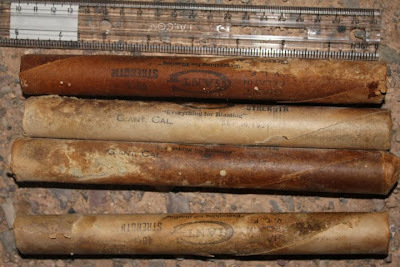 The photo of the four sticks shows that their wrappings were in good condition and still readable, revealing that they were manufactured in September 1921. So for 89 years these sticks lay in some crack, only to eventually roll out onto the trail.Fortunately they were stable enough not to explode before they could be discovered and removed. Examination of the crack didn’t reveal any more dynamite higher up in the crack, so maybe these four are all the sticks that were there. How did it get there?Good question. 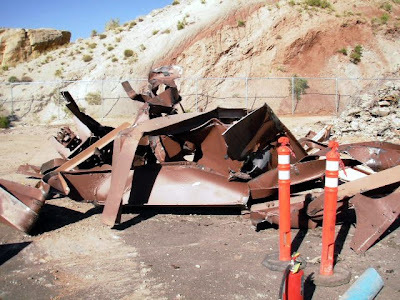 Were they part of a failed explosion, part of the lost explosives shed, something that simply feel down into the crack, or is there an even more bizarre story behind this? We will probably never know. What we do know is that we had a pretty close call with an event that couldn’t be planned for. Dumb luck I suppose. Photo courtesy of Steve Morin, National Park Service. BY THE WAY, DID I HAPPEN TO MENTION HOW I FEEL ABOUT ACCORDION MUSIC? Even though the Quarry Visitor Center was evacuated in the summer of 2006 there has been an on-going concern about the continuing structural degrading of the building. 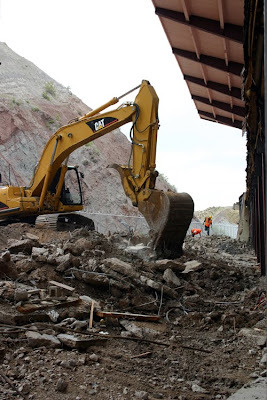 “Will the building collapse before it was replaced?” or “Might some of it collapse once demolition is underway and parts of the structure are removed?” are questions that have hung over our collective heads. Well so far, so good. 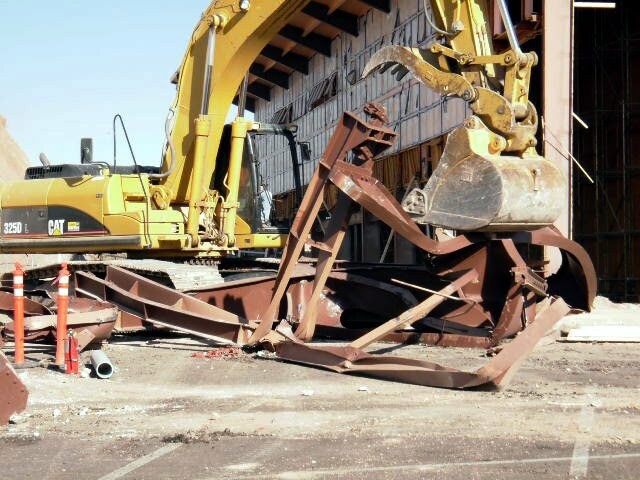 We have removed the administrative wing that housed the library, offices, and prep lab. Our next major problem is the demolition of the turret or rotunda part of the building. One last look at the crack monitors on that part of the QVC is instructive and enlightening. 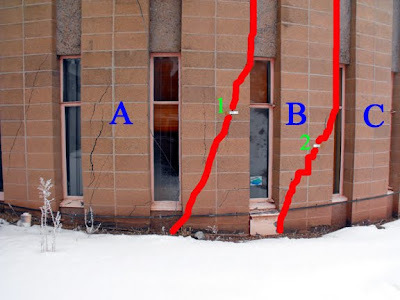 Recall that there are several spiral crack systems running around this cylindrical building. Two of them have crack monitors attached to them. In fact, it was alarming data on building movement from these two gauges that prompted, in part, the emergency closure and evacuation of the building. For this discussion on the photos I have traced the cracks with the monitors in red and numbered the gauges 1 and 2 in green. 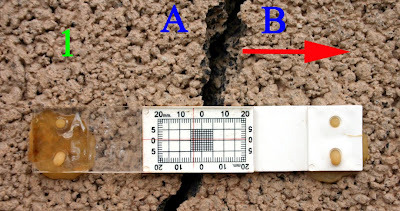 The segments of the building defined by these two cracks are labeled A (northern segment), B (central segment) and C (southern segment). Let's look at the crack monitors. Remember that when installed, the red crosshair is located in the center of the crack and that subsequent growth of the crack will move the crosshairs off center. Monitor 1 shows that building segment B has moved to the right (southward) relative to segment A. 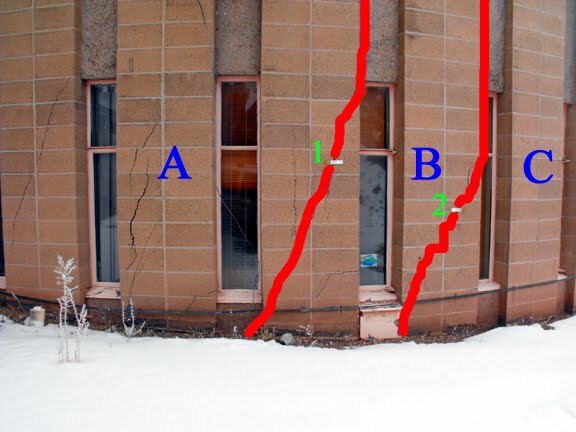 Monitor 2 shows that building segment C has moved to the right (southward) relative to segment B.
Compiling all this into one photo, with blue arrows indicating the direction of movement, reveals that the building segments are moving apart from one another. Pretty scary stuff. But matters are actually worse than they appear. 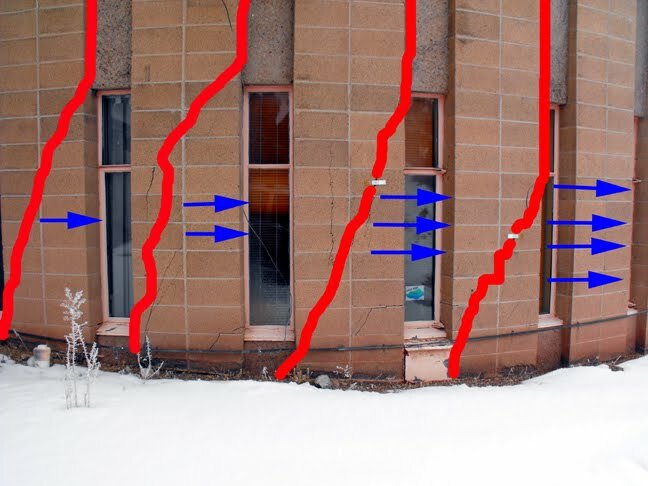 There are many more spiral cracks running around the building than just the two we’ve been discussing. 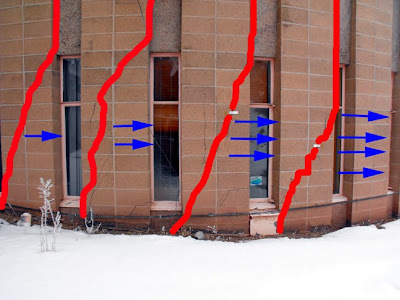 If we likewise mark some of those other cracks in red and the movement in blue, we see that the turret is really expanding southward, just like an accordion. By the way, did I happen to mention how I feel about accordion music? Although the Irish punk bands Dropkick Murphys and Flogging Molly use accordions with good effect, I must admit that generally I hate accordion music. I hate buildings that act like accordions even more. 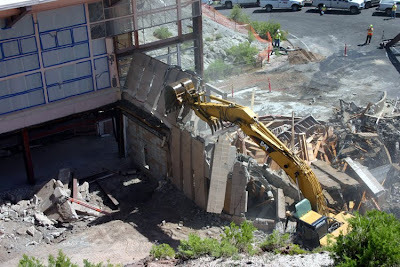 “The Quarry Visitor Center Rift Valley” “The Mole People’s elevator shaft” “That $@%! **^%ing crack” The large crack running nearly the entire length of the floor of the QVC administrative wing went under many monikers. Like some extensional regime snake it wove its way across floors, under walls, through sidewalks, and well out into the parking lot. On one side of the crack, the floor was lifted up nearly two inches. 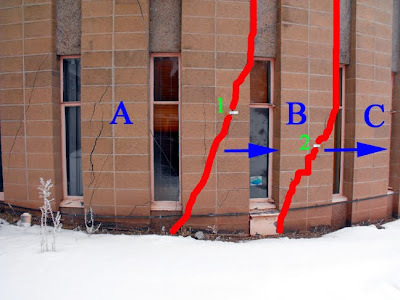 On the other side of the crack the floor sloped six inches over a distance of eight feet. 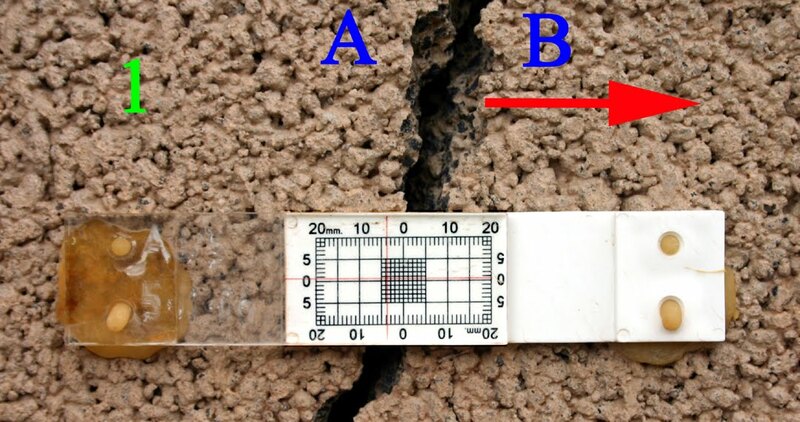 After the QVC was evacuated, the crack continued to grow and the vertical displacement increased. 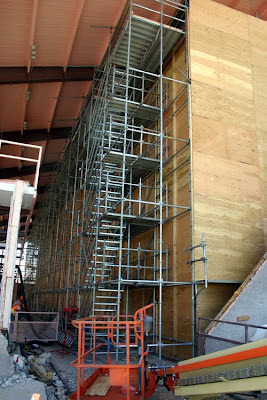 Segments that were just thin cracks a few years ago were now much wider and floors were sloping to greater and greater degrees. 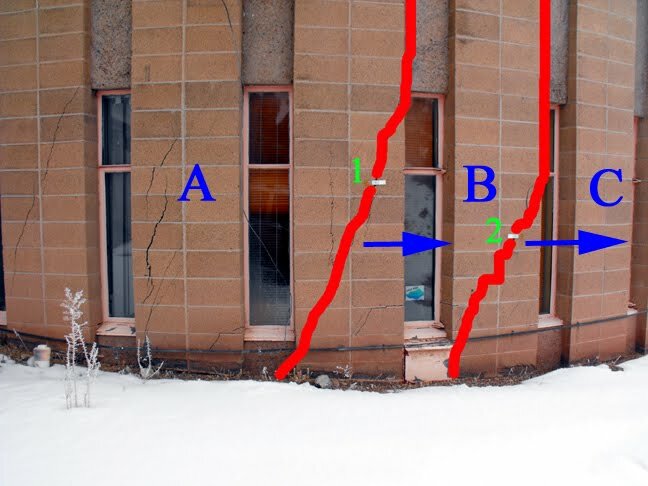 Of course, the crack was only a manifestation of the geological phenomenon beneath it. 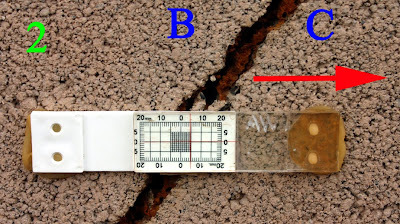 The water loving bentonitic mudstones had not been deeply excavated before the QVC was built and water leaks and other sources of water caused the bentonite to expand tremendously and then shrink as it dried out. 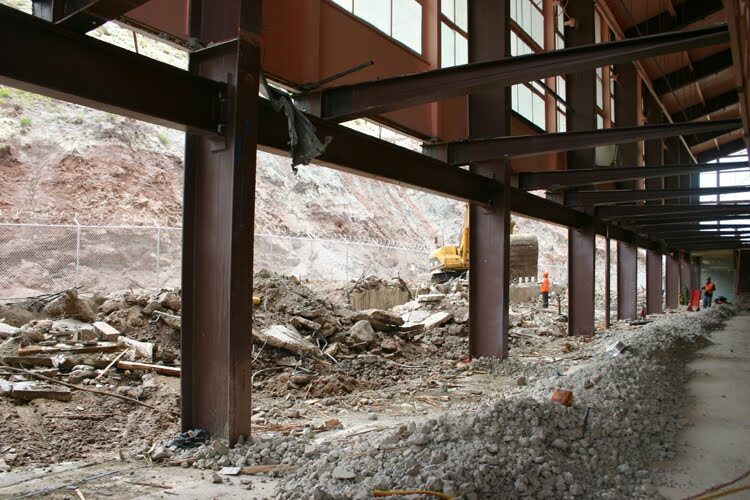 Eventually the entire southern half of the administrative wing was lifted up, creating the infamous sloping floors of the park library, paleo office, preparation lab, and furnace room. Some of my earlier posts show photos of this most unusual “natural wonder”. A great deal of time and money was spent over the decades mitigating the effects of the catastrophic benonite and water mix. 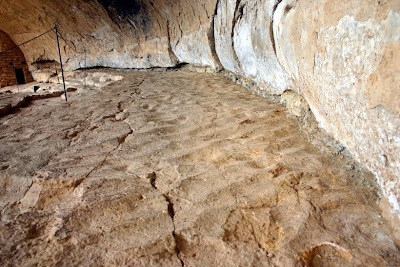 Unfortunately these were mostly cosmetic because fixing the problem of the bentonite under the entire floor system was well nigh impossible. Until now. I am happy to announce that we have finally secured a way by which the problems of the crack in the world have been finally and irrevocably solved. 1. Remove roof of administrative wing. 2. Cut away and remove I-beams forming roof support for administrative wing. 3. Tear down the walls of administrative wing. 4. Tear up concrete floor of administrative wing. 7. Do not replace administrative wing. Birds (i.e. the still living theropod dinosaurs) can be a touchy lot, especially when it comes to disturbances around a nest. They are generally sensitive to noise and activities occurring in the nesting area, especially when these are on a sustained basis. 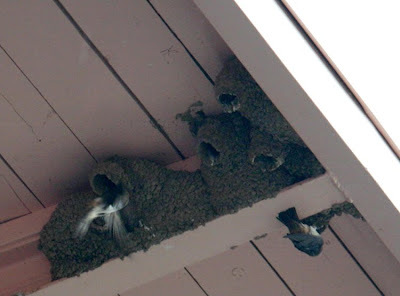 So it is quite remarkable to have watched Cliff Swallows (Petrochelidon pyrrhonota) nesting under the eaves of the gull-wing roof of the Quarry Visitor Center. 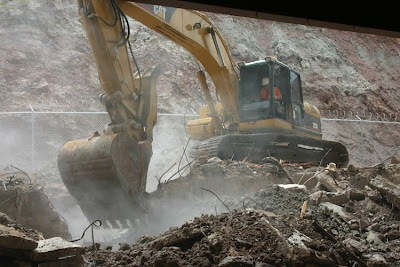 The quarry construction began in late April well before the swallows arrived to nest. The building has been the site (both inside and out) of pounding, yelling, hammering, large gas-powered lifts raising and lowering people and equipment, the building of the giant box enclosing the quarry face, a great deal of truck and car traffic, large pneumatic pavement busters, jackhammers, abatement teams with their exhaust systems, construction dumpsters being filled with wood, metal, light fixtures, and all sorts of recyclables, cutting and removing of windows and frames, tearing out of drywall, tearing out of 2x4 framing, tearing up of roofs, and tearing down of cinder block walls, etc. 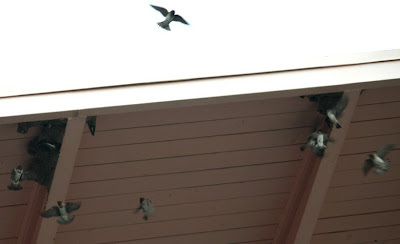 but NONE OF THIS has had any effect on the three colonies of birds that selected the eaves as the place to build their nests, lay and hatch eggs, and feed their young. Up close I observed birds flying in and out of nests within 5 feet of welders in a crane basket using acetylene torches to cut away upright I-beams. The birds even carried on as normal while the 28,000 pound crane was pulled out from the Quarry Visitor Center, passing only a few feet below their nests (see red arrows in photos pointing out part of one colony). Cliff Swallows have been nesting under the Quarry Visitor Center eaves as long as I have been at the Monument (30+ years) and were doing so well before I arrived. Obviously they find it an appealing location. 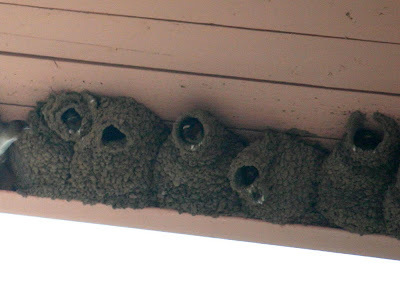 However, not to abandon the nests during the outrageous amount of construction going on within feet of them is truly remarkable. But then again, would you really expect anything less of a theropod dinosaur?